SAP Web IDE Versions… Which do I use…? UPDATE (May 14th, 2018): SAP Web IDE Full-Stack is now ready! When SAP Web IDE Full-Stack was first launched, we suggested to use each version for different needs (SAP Web IDE for Fiori development and SAP Web IDE Full-Stack for CF development), until we consolidate the two versions into one. Moving forward, we plan to put all our efforts into the SAP Web IDE Full-Stack version. We recommend to start migrating your projects from SAP Web IDE to SAP Web IDE Full-Stack. The migration process is very simple and takes a few minutes! Check out this blog for the official announcement and this blog for helpful tips to help you migrate easily. So many SAP Web IDE versions… no wonder you’re confused! when you should use what. SAP Web IDE is a powerful, extensible, web-based integrated development tool that simplifies end-to-end SAP application development. To work offline, download and install the personal edition of the SAP Cloud Platform, Web IDE. The complementary personal edition IDE can be installed on a personal workstation for offline development by a single developer. You can combine both versions, using Git to sync your local workspace and your Cloud Platform account. The personal edition excludes some of the features of the cloud-based version of SAP Web IDE, such as zero administration, certain optional plugins, and other cloud specific features like building mobile apps. For evaluation purposes, you can sign up for a free SAP Cloud Platform trial account to explore SAP Web IDE based development. Once you are ready to start development, you have to acquire an SAP Cloud Platform license or SAP Web IDE user license. Full-stack application development for SAP Cloud Platform, Cloud Foundry environment, consisting of several modules, such as a HANA based model, business logic (written in Java), and of course Fiori/SAPUI5. If you prefer to work offline, or if you don’t have access to a corporate SAP HANA system, you can also download and install the SAP HANA express edition and the XSA based tool package on your workstation. Install SAP HANA and the XSA tools, including SAP Web IDE for SAP HANA. Use the IDE to develop full-stack business applications for SAP HANA and its XSA application server. You can develop and test UI5/Fiori apps, business logic and OData services with Node.js, XSJS and Java, as well as SAP HANA code and data models. All these parts of a complete business application can then be assembled into an archive package for deployment to a productive SAP HANA platform. Why having multiple versions of SAP Web IDE? This situation is temporary. We are currently in a transition phase from SAP Cloud Platform, Web IDE to the SAP Web IDE Full Stack. So, which version should I use? Currently, while we’re still in the transition phase, for any UI development including Fiori and SAPUI5, you should keep using the SAP Cloud Platform, Web IDE version. 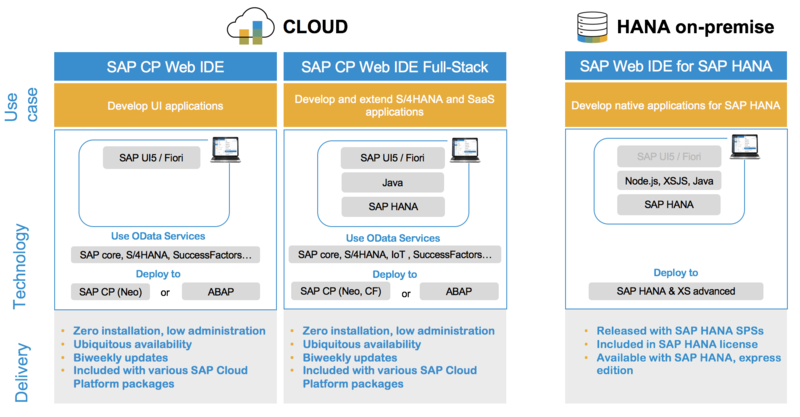 For developing SaaS apps and extending S/4HANA, use the SAP Web IDE Full Stack version. For any HANA Native application development, use the SAP Web IDE for SAP HANA version. We plan to consolidate the versions of the SAP Web IDE to minimize the differences. Once the transition phase will end, we will ask you to start migrating to SAP Web IDE Full Stack, providing you with the proper guidance and assistance. Our strategy is to have ONE SAP Web IDE. Should I move my development to the SAP Web IDE Full Stack version? If you are using SAP Web IDE and it suits your needs, we recommend not to move yet to the SAP Web IDE Full-Stack version. You can use the SAP Web IDE Full-Stack version, if you have an interest in the new capabilities that are offered in the SAP Web IDE Full-Stack version e.g. full-stack application development, using Grunt build, integration with SAP API Business Hub, support for SAP Leonardo. If your interest is only Fiori/SAPUI5 development we recommend using the existing SAP Web IDE version. Follow these steps if you want to move an existing project to SAP Web IDE Full-Stack version. Do I have to purchase anything to be able to use SAP Web IDE Full Stack version? No, you don’t have to purchase a new license. you can use this version under the terms of your existing license. Will the new capabilities of the SAP Web IDE Full Stack version be offered in the SAP Cloud Platform, Web IDE version? No, we will continue to maintain the current SAP Web IDE version, but new features will be introduced in SAP Web IDE Full Stack version. If you have any other questions, ask our community, check out our documentation, or contact us. Register here to get the latest news and updates from SAP Web IDE. If I understand it correctly, then SAP Web IDE Full Stack version will be the version for the future. The SAP Cloud Platform, Web IDE is from now only in maintenance mode and will get only bugfixes. Does the new SAP Web IDE Full Stack version have all the functions of the old SAP Cloud Platform, Web IDE at this time? There are still some gaps between the versions in terms of existing features, for example Git Stash, tag, running with performance measurements, etc. But it’s all a work in progress and these gaps will be closed. From web ide personal edition, can we connect to git cloud account. From cloud it connects well. The project structure of WebIDE and WebIDE Full-Stack is different. E.g. the project stored in one IDE can be opened with errors in another IDE. Is there a way to convert the projects? Currently we are using Web IDE to deploy to a SAP Enterprise Portal 7.5, after enabling its plugin. The deployment to SAP Enterprise Portal, will not be done through SAP Web IDE Full Stack directly, instead you will have to export the UI5 project\component from Web IDE and to import it to the Enterprise Portal (by uploading it to the Web Recourse Repository). Please also note that we are in the process of writing a blog with more details about the replacement of the WEB IDE deployment to the Enterprise Portal, and we will publish it soon. Do we have plans to support Node.js / xsjs in the Full-Stack version? That will make it possible to build XSA applications directly in the Cloud (without having to use an on-prem HANA system with XSA support). Also, for HANA development using the Full-Stack version, currently I can create a SAP HANA database module and manually create various files (.hdbcds, .hdbcalcuationview, …) using the text editor, but I don’t see menu options for creating these various types of files. Nor do I see the graphical editors for calc views, etc. Are these features also currently under development? Yes, Node.js will be joining WebIDE soon. As for the comments on the additional file types missing, we are on it as well, the calc view editor should be already available, please check Whether the “Tools for Hana Database development” on the Web IDE features is enabled. I am using SAP Cloud Platform, Web IDE Full Stack Version and I have activated the “Tools for HANA Database Development” on the Web IDE features. graphical editor, for which I am waiting for so long now. Can you tell me how to use these features, as long as they are available. Thanks for the information. With your block I was at least able to identify the required tools for our required developments. Can we licence ‘SAP Web IDE Full Stack’ as a component? If yes, do you have an appropriate link to the web site? We need licenses for 5 developers and the SAP website ‘https://cloudplatform.sap.com/pricing.html’ is bit confusing ☹. When purchasing SAP Web IDE you get both SAP Web IDE and SAP Web IDE Full-Stack services available in your SAP Cloud Platform account. You can purchase it as a standalone package, or get it as part of SAP Cloud Platform package. We’d like to use ES6 and Babel (to make the scripts work with IE11 as well) together with our internal git Repo. As I understand, we’d need to use SAP Web IDE Full Stack for doing this. -> Is it planned to make SAP Web IDE Full Stack available for use on-premise (downloadable similar to Personal Edition or provided in ABAP-Stack…)? Not at the moment. As you know, the future of software development is in the cloud, and we’re investing heavily in that area. I recommend to use the SAP Web IDE Full-Stack to enjoy our latest and greatest features for full-stack development, including our Grunt builder. Unfortunately using the cloud products is an issue (security and privacy regulations) for us in the public sector. All our (non SAP) cloud applications are hosted on premise. Do you know if it is possible to add Grunt to the downloadable SAP WebIDE Edition manually? It is not possible to add Grunt to SAP Web IDE, personal edition. However you can export your project, unzip it, run Grunt build using the Grunt CLI, and then import the results back to Web IDE into a ‘dist’ folder. I have a question regarding Web IDE Full Stack: Can I run hybrid mobile applications on an emulator or a device? And if yes, how? Is Node JS available in Full Stack Web IDE now? Not yet, but soon. Stay tuned to our What’s New updates in the documentation. The article above was written back in September 2017 and I was wondering if the recommendations for which version to use still apply now in May 2018? We will be using the Web IDE for mostly Fiori development (for now) so should we be using the Web IDE as stated above or has the migration of functionality to Full Stack been completed and we should be using the Full Stack version? We are just starting out so porting of existing projects is not a concern. Thanks for the detailed blog with differences between versions. I have question regarding licensing. If customer have existing license to use WebIDE for HANA, do they need to still buy a seperate license to use either WebIDE for cloud or WebIDE full stack ? I know you mentioned they dont need a seperate license to use full stack if they have existing one. but want to know is it true just only with Cloud version or HANA version also ? You need to have a “cloud” license in order to use SAP Web IDE on the cloud. SAP Web IDE is included in several packages as well as a standalone, please find more information in our FAQ. is it possible to deploy an MTA application (which includes HANA DB artifacts like tables, view, etc) onto SAP Cloud Platform Neo using SAP Web IDE Full Stack? Or is it only SAP Cloud Foundry supported? Only Cloud Foundry is supported. thank you for the information. The support of SAP CP is in the pipeline yet or it will never be? We are a company running our SAP Gateway on premise, and we like to use SAP Web IDE to use templates, plugins like Build.me (which has been disabled), and other tools that make UI5 development easier. We could use Eclipse, but our life would be much harder. We are not thinking of going to SAP Cloud Platform because it doesn’t make sense to buy the entire cow just to get the milk. But I’ve seen SAP pushing customers into this direction just to get additional subscriptions. For me it’s almost like charging extra for SAP GUI, Eclipse development tools, and so on. But SAP has the rights to do it, according to its strategy of getting a bigger profit with cloud subscriptions instead of one single on-premise sale. 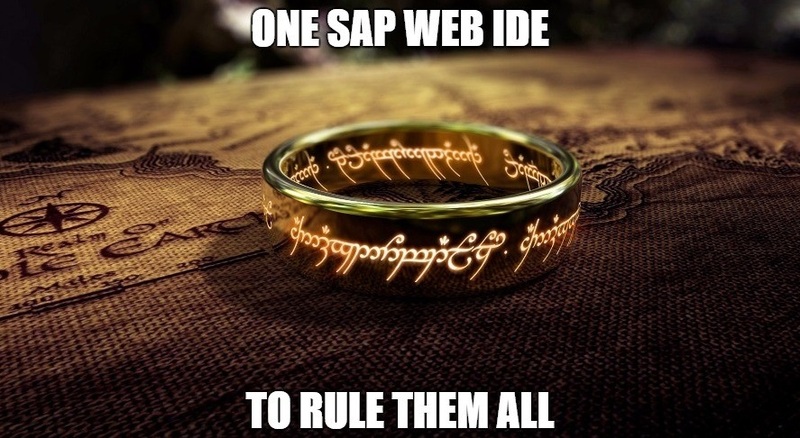 That said, for companies who just want to use SAP Web IDE as a tool for on premise SAP UI5/Fiori applications, which version/licensing should we acquire? Is it “illegal” to use the SAP Web IDE Personal Edition for a trial/prototype and then import the code and deploy from Eclipse, which is free? We are quite lost in the complicated SAP licensing model. Maybe as a Product Owner you could explain or at least give us the right direction. What is the plan for merging SAP Web IDE Full Stack and SAP Web IDE for SAP HANA? It would be nice to have all the functionality from SAP Web IDE Full Stack on SAP Web IDE for SAP HANA. You may be asked so many times about license. I’m sorry to ask about license again. When it comes to licenses, there are 2 types of Web IDE. Trial use(personal version) and Productive use. Can ‘productive version’ connect to on-premise server directly like personal version without connecting to HANA Cloud? If ‘Productive version’ is not allowed to connect to on-premise server directly, Can I use trial(personal) version for productive use with HANA license? Trial use has no license, it’s meant for trial so it doesn’t cost money and no license is required. As such, it’s not formally supported by SAP and isn’t allowed for productive use. The personal edition can be used productively if a cloud license is acquired. Yes – simply acquire a cloud license and use the personal edition productively. I was confused Personal edition for PRD with Cloud edition. I should’ve read document more carefully. As described in the picure it is not possible to develop “normal” SAP UI5 Apps with an OData consumption within the SAP Web IDE for SAP HANA?